TO THE FLEA MARKET AND BEYOND! It was the usual Saturday morning, up at five and out of the door by six. The flea market was loaded with vendors. I believe everyone who had cleaned out their homes of extra stuff came to sell it at the flea market today. It helped that we had sunshine and warm weather to pull all those rain sodden recluses out of the mud and back into the life giving light. Its amazing how a little sunshine can change a person from a scowling umbrella carrying zombie into a light hearted smiling human being. There were a lot of the usual vendors there, but there were also some fresh new faces with tables full of wares that had been pulled out from overstuffed garages, closets, and kitchen cabinets. There were all kinds of neat gadgets to catch a pack rats eye, fortunately I am not a pack rat and have a small home with little storage. Whenever Sonny and I walk down the rows of overflowing tables that spill out onto tarps on the ground, we ask ourselves if we really need anything. His eye is out searching for useful tools and I look for old rustic objects that would look nice as yard ornaments. I look for things that would work well as flower pots like old buckets or watering cans. 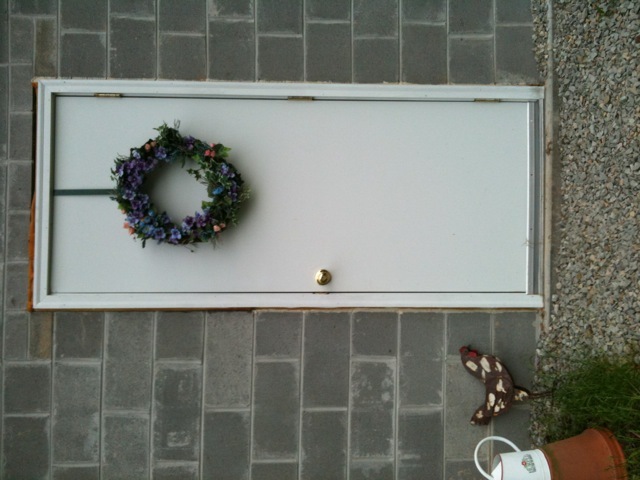 I found a pretty flowered wreath to hang on the root cellar door. Even a root cellar door can look festive. Carol likes things that can dress up the outside as well and we often grab for the same item. 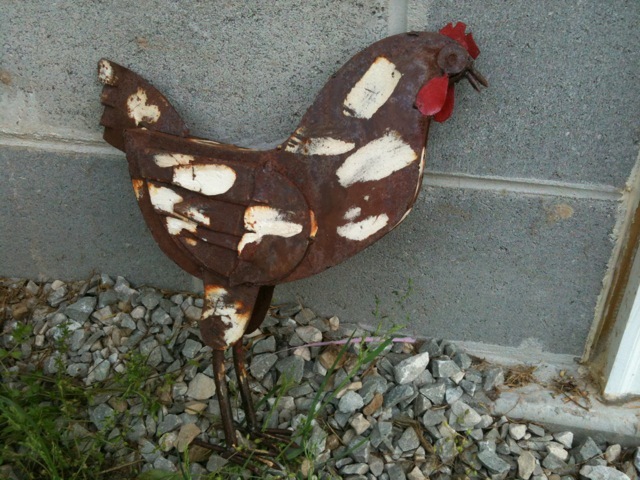 Today there was a rusted metal rooster that we both liked. Of course Carol being the nice person she is asked if I wanted it, but even if I did I would not take it from her. First come, first served. I would have to tease her a little about it first, but we were in luck today. Apparently there were a pair of roosters and the lady who was selling them brought out the second one and said we could have them both for five dollars. So we split the cost and we both went home with a homely looking rusted rooster with paint splashes for color. He will look just divine in our flowerbeds. After the flea market and our traditional breakfast we went to Tractor Supply, Lowes and the feed store. I picked up six more strawberry plants and I got them into the ground as soon as I got home. We stopped by Two Lynne’s Farm for a short visit and of course I came home with three Coleus plants that Sandy didn’t have room for. I seem to always leave there with something fuzzy or potted. Our guinea girl is still sitting on her eggs. Lynne and Sandy offered to let their turkey hen sit on some of the eggs until they hatch. Apparently she has been successful surrogate before. I think we just might take a dozen over for her to hatch. Sandy said they tried letting their guineas hatch their own, but once the eggs hatched the parents ended up leaving them to fend for themselves. I had read about that, but Lynne and Sandy have years of experience under their belts when dealing with chickens, guineas, ducks, geese and turkeys. So maybe we will have a few baby guineas after all. I would like to give a shout out to cousin Arlena who I hear is a new blog follower. Welcome. You know how those Aunties gossip. This entry was posted on Saturday, May 21st, 2011 at 8:29 pm and is filed under Gardening, Guineas, Homesteading, Off-Grid, Root Cellar. You can follow any responses to this entry through the RSS 2.0 feed. You can leave a response, or trackback from your own site. One Response to TO THE FLEA MARKET AND BEYOND! LOVE the rooster. I’d bought just the one for 5!